Dallying In The Dirt, Issue #215--- Voracious rabbits and snow in late April are frustrating. Spring can be such a beautiful time of year but for a gardener it can also be a very frustrating time. It was easy to sit and write “Dallying” this morning because, for the second day in a row, near the end of April no less, there was fresh snow on the ground and the thermometer was sitting at 0 C. Venturing outside just did not seem to be an option. 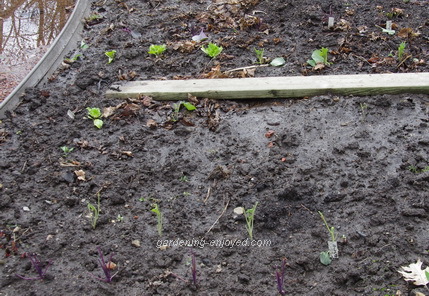 If I did go out I would wander to the spot where I planted all those vegetable transplants last week and become even more frustrated when I surveyed the little stumps that the rabbits left of my carefully grown Pak Choi etc. Every single plant, gone. I will plant the remaining half of the plants inside the fenced area and find out for sure whether my fencing is a sufficient deterrent. I’m not really sure that I want to know the answer. The traps have been empty and sprung a couple of times this week. I don’t know how they manage to do that. Only a few of the seeds that I planted last week have had the courage to show themselves. Before the cold and snow we managed to have a couple of days of torrential rain that had the bottom half of the garden looking like a rice paddy. 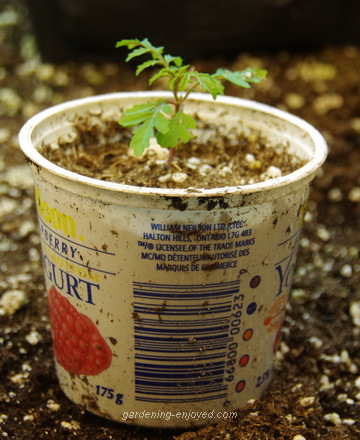 It will take more than a few days of warm sun to make that soil anything close to plantable. The purple Pansies look quite lovely with a sprinkling of white snow flakes on them. Crocus and Scilla and Chionodoxa are blooming in great profusion and the cool weather has helped to extend their bloom period. The deep blue of the Scilla flowers continues its relentless spread throughout the garden. I would have preferred them to spread only in the lawn but apparently they are not that trainable so they are now wandering through the perennial beds. They will be lovely and then gone before anything else is blooming so I will just accept their bounty. 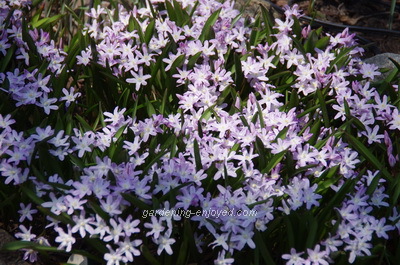 The pink Chionodoxa are also great spreaders. The beds that they occupy are a solid mass of pink bloom. I used to be careful about their bulbs when I planted other things in those beds later in the year but I’ve realized that they don’t care how much I disturb them or move them around. Next spring they return as that solid mass of colour. Make a mental note of someplace that would look good with this display and then remember it when buying bulbs this autumn. Both Chionodoxa and Scilla bulbs are quite inexpensive and their ability to spread makes them a great bargain. For obvious reasons I have managed to spend considerable time in the basement this week. All of the summer season crops have been transplanted from their seedling trays into the cell paks that will be their homes until the warm weather summons them to the garden. Strange things happen constantly in a gardener’s life and this week was no exception. I like to grow the very small flowered Marigolds in the Gem series. They seem to effectively deter the white cabbage moth and those little flowers are a great edible decoration on the dinner plate. I collect seed from them each year to grow next year’s crop. One seed germinated this year. One?? If the seeds were not mature enough to be viable then why did one of them grow. I’ll now have to look for these as transplants in the garden centre. It’s not that I mind buying a few, it’s that they are not easy to find. At the transplant stage they tend to be stringy little plants that most people, who don’t know their potential, won’t buy. As a result, garden centres tend not to grow them. None of the retail seed racks I looked at this week had any either. The online catalogues certainly list them but time is running out. The Tomatoes and the Peppers and the Eggplant that were transplanted, are all looking good and reminding me that warm weather will undoubtedly arrive. Next week I’ll be back down there seeding the short term crops such as Cucumbers and Melons and Morning Glories and maybe a little Okra, one of the most beautiful vegetable plants we grow. Tom Asks? We just moved to a house with a water softener system. Is it ok to use the water for house plants (palm tree, spider plants,etc)? Ken Answers! No, is the short answer. Most softeners substitute sodium for magnesium and most plants don't like sodium. Many softener systems have one tap in the house that bypasses the system. Claire Asks? Something is starting to dig little holes in my lawn at night. Who are they and what do they want. Ken Answers! Those little holes are usually produced by skunks and they don’t mean to hurt your lawn; they are looking for the grubs that live under your grass. They are doing you a favour by eating those grubs but they leave a huge mess. You can kill the grubs by applying parasitic nematodes to the lawn. If all of the skunk’s food is gone they will stop digging.